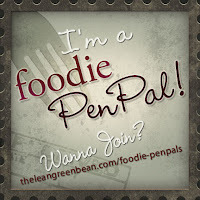 May Foodie Pen Pal Revealed! This month's Foodie Pen Pal came from Martha at MLLrungirl. It's always interesting each month to see what I receive since I am not a picky eater and have no dietary restrictions. I generally ask for unique seasonings or marinades since I love to cook. Martha listened to my request and sent me an awesome BBQ themed basket, perfect timing for Memorial Day weekend! We have never tried Popchips before but will be trading in fattening chips for these bad boys when craving salty crunchy items. They are SO GOOD. Only 120 calories, 4g of fat, 0 saturated fat & 18 carbs per serving (the whole bag has a total of 3 servings). You could eat the entire bag for around 350 calories! Not that I would eat an entire bag of chips in one sitting :) I must add, this item was "tested" by Gabe first. I luckily got to try a few chips before the bag was gone. So when I saw the Dinosaur BBQ sauce, I was intrigued. Martha said it was from a local BBQ joint where she lived. What I did not expect was to see this restaurant on The Next Food Network Star, "NYC on the Go episode". As I am obsessed with everything Food Network, I have to say this was a special surprise. I made my famous Baby Back Ribs and used this sauce instead of Sweet Baby Rays. Gabe thanks Martha very much for this snack. I think I may get him his own Foodie Pen Pal because every time someone sends snacks, they magically disappear. I haven't had the chance to try this spread out yet but can't wait to try it! And lastly, Wegmans chicken BBQ marinade. I have to admit, I have never seen white BBQ sauce before now! I am very excited to try this out on my parents new grill when I go home this weekend! Hopefully by then they will have learned how to cook on the Infrared beast. This month, I sent my Foodie PP, Racheal (from Running with Racheal) a Tampa influenced box. I was very happy to get Racheal, she runs & she likes all kinds of food. I felt like I was shopping for myself! Check it out! 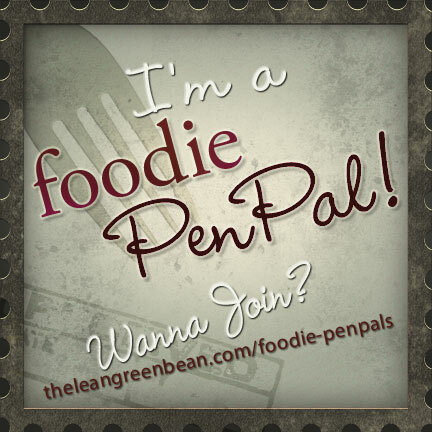 If you are interested in becoming a foodie pen pal, contact Lindsay at the Lean Green Bean. Here is a link to the registration sheet. Tampa's Cuban Sandwich Festival in Ybor City!